Ethiopia can offer to a traveller very much, from historic sites of the north to the tribes of the south. And all this during almost whole year. The rain season is approximately summer in the north and spring in the south (Omo valley). But I don't want to rewrite a guidebook here so just a few practical comments follow. Ethiopians know English quite well because children study it from the beginning of an elementary school. Later courses and textbooks, even during second part of an elementary school, are all in English! Amharic (the official language of Ethiopia) is studied just as a single course during later studies (I was told this). But to know some Amharic phrases is always a great plus when communicating with people. David Appleyard's "Colloquial Amharic" with cassettes is great for more devoted people, Lonely Planet "Amharic phrasebook" is OK most of the people. Many travelers, guidebooks and articles on the web write about a kind of xenophobia in Ethiopia , with children shouting "faranji" (means foreigner in Amharic) on you. It is true for the the more visited north, the Highlands (approx. the area of Amhara nation), especially. But one can get used to it I think and ignore it quite well. I'm not sure if the reason is a real xenophobia. It may just be a kind of a game for small children. The south, with many different non-amharic tribes, is almost free of this. Ethiopia has remarkably good national Ethiopian Airlines . For international flights, they are not the cheapest usually. But they can be used for interesting African combinations with free of charge and not time limited stopovers in Addis Abeba. They serve many other African countries from Addis Abeba. For national flights, although the foreigners rate is about twice the Ethiopian rate, one can think if it is better to save 2 days in a bus with 100 USD flight or not. Flight can be cheaper and more effective then renting of a private jeep, which costs about 150 USD / day. One great thing with Eth. Air. is, that if you do not use your ticket (and you don't have to tell them before), they will give you all your money back - but in the office where you bought the ticket only. Dates can be changed for free as many times as you want as well. So it is a good idea to buy even the tickets for which you are not sure about the date or even destination in advance (so you have your seat) in Addis Abeba, where you probably return eventually (in case of returning an unused ticket). This flexibility is great. They even accept credit cards in Addis, but then the refund is in about 3 month to you credit card, not in cash (I tried that). One bad thing with this flexibility is, than you should check a day before the flight if the flight is not cancelled. They can do it if the number of passengers is too low. Buses are a great place to meat ordinary local people and one should not avoid them completely. They are quite cheap but quite slow as well. They can travel about 300km for a day only even on an asphalt road and they don't go over the night at all !. The bus transport in Ethiopia is quite strictly organized and Bradt guide even call it a bus ceremony . The long distance buses depart in the early morning only usually. They tell you e.g. 5.30 a.m. but this is the time when a mass of people is allowed to enter the before then closed bus station compound. Then the luggage starts to be loaded and additional tickets sold if possible. The real departure is at least 1 hour later, e.g. at 7 a.m. It is better to have tickets bought from a previous day (but not necessary), because you can come a bit later, around 6 a.m. lets say. Conductors usually don't sell more ticket than the number of seats in the bus fortunately. Buses are quite crowded with people transporting many things, anyway . Bigger luggage must go compulsorily on the roof usually and if the luggage man puts it for you there, he usually requires some payment (I put it there by myself, but had to argue with them sometimes). Another strange thing - one has to keep the bus ticket during the whole (even more days long) journey, because tickets are collected at the end of every journey. Maybe for some accounting or just bureaucratic purposes, I don't know. As far as Central Europe in concerned, visa to Ethiopia can be arranged even during 1 day in Vienna, normal period of stay is 1 month, but 2 months can be requested as well (better to take a return ticket or a booking for this period to the embassy as well in this case). Simien mountains are a great place for short treks, but it is no off the beaten track destination any more. But it is worth of visiting. I mean the national park area. I guess you would meet no foreigners outside the park . There is a jeep road over all Simien mountains unfortunately and it is being constructed to lead further along Ras Dashen mountain to join the Lalibela-Sekota road (which leads in the north-south direction). When this road is constructed, it could be used for mountains bikes for example ... According to rules, one has to start from park headquarters in Debark, where it is obligatory to pay a park fee + a fee for a compulsory scout. It would be possible to avoid the scout, but one would have to start from somewhere else than Debark. And better not to end in Debark as well, because locals are used to see every foreigner accompanied by an armed scout. One should better miss the usual villages and campsites in Simiens probably, so it has some disadvantages as well. But the lack of the scout company could be a great freedom for some people. 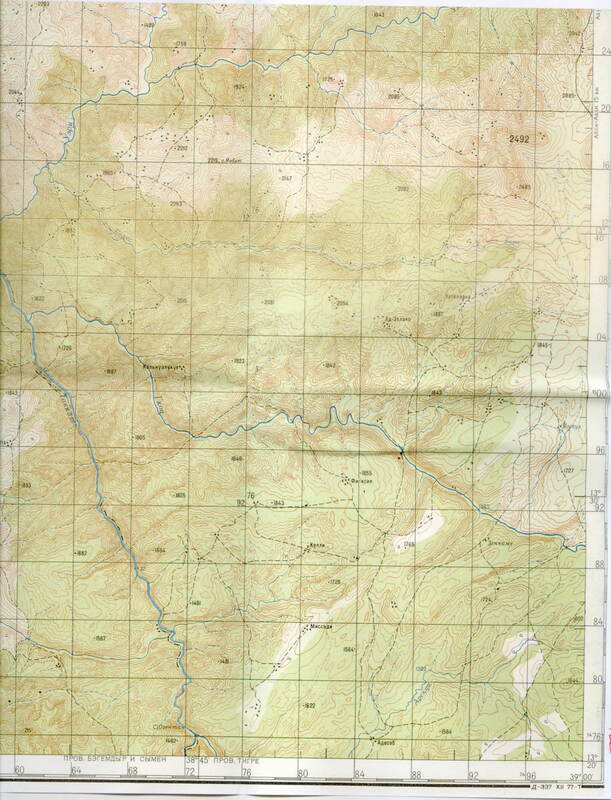 With the compulsory scout, it is not probable to make any other trek then the usual one (described in both LP and Bradt guidebooks), because one is allowed to camp at designated campsites only (but short 1 day detours are possible, with return to the the official campsite). Better to take a quite warm sleeping bag (especially if one does not take a tent), because temperatures can be a bit below zero during the night. 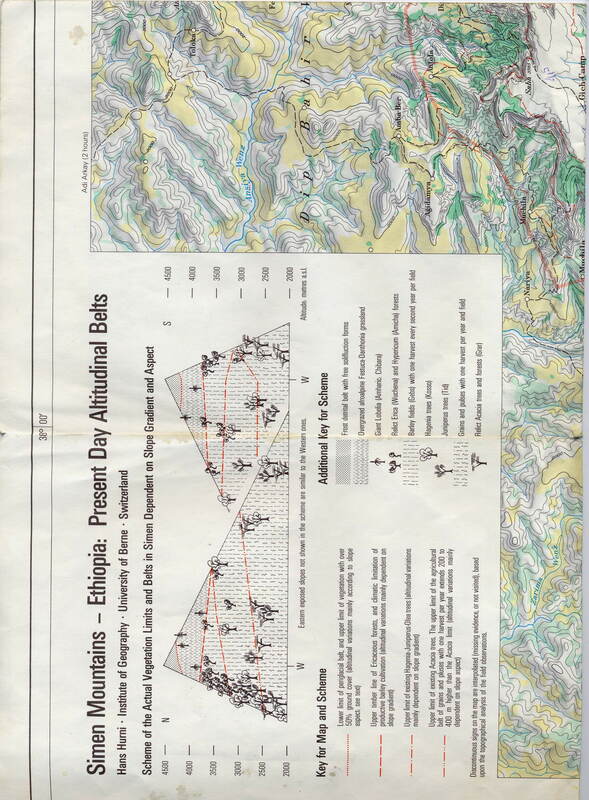 It would be an interesting trek to go over Simien mountains and continue towards Mekele or Lalibela (for up to 2 weeks, at least the 1:250 000 maps from Addis would be necessary for this and better to end in Simiens to avoid starting with the scout from there). Some people have done this trek, look e.g. here http://www.ag.wakwak.com/~ikeken/africa/index-e.html. One has to cross the Tekeze river - there should be an interesting book about rafting this river called The Lost river. Very nice quite flat mountains, especially when not so dry as on my photos (thousands of Lobelias would be there in Aug, Nov, maybe even Dec). There are almost no tourists there and it one has this good map, it is possible to get off the bus e.g. in a pass with radio tower and don't go to park HQ (and not to pay any fees, although this was not the prime reason, the pass is just better located for trek start, I think). 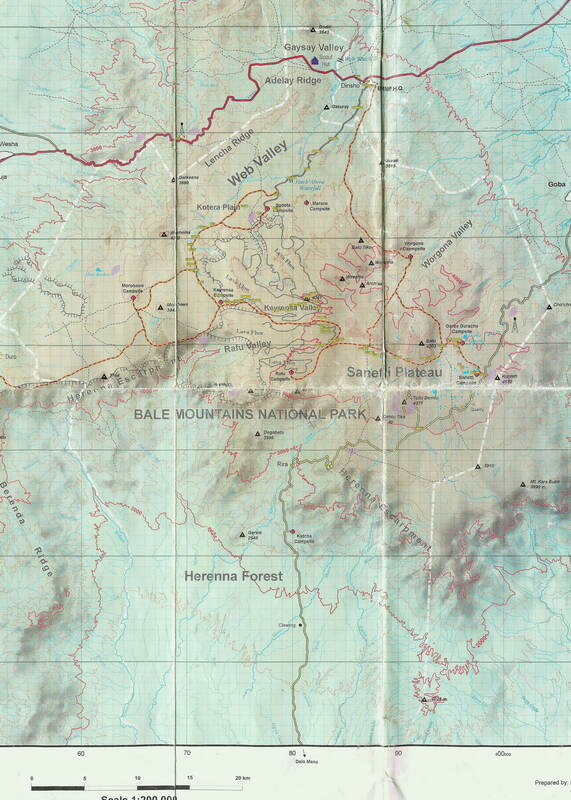 But Harrenna escarpent and forest on the southern slopes of Bale NP are the most remote and best are here, definitely. With pleasant people, as well. Most people go to northern Ethiopia to see old sites of Ethiopian Orthodox Church . Guidebooks list several must-to-see places like Gondar castle, village of Lalibela, Lake Tana monasteries, Blue Nil falls, Simien mountains etc. I was mostly disappointed with all these highlighted places (except for Simien mountains - see above and partly Lalibela). But it could be because of my too high expectations before and experience of hospitality in remote mountains of ex-USSR. These highlights are generelly full of tourists and both normal people and local authorities just think how to get money from them. But if one gets off the beaten track, which can mean just a few kilometers away or even just to a hotel unlisted in gudebooks, it can be a great change. As far as pure spectacularity of these highlights is concerned, that is more a matter of private opinion. For a person, who in interested in remote mountains and living unspoiled culture, these places offter static or dead culture - e.g. a castle, church....monks just waiting compulsory payment for opening a door of a church to see some old paintings on the wall. Well, it the country is not rich enough to pay for conservation of these sites, why the tourists who arrive should not pay it ? Well, that is true... I don't visit churches and castles in Europe, so I should not expect anything more from Ethiopian churches maybe. And there is not much more to see there than these paintings - I'm writing about Tana lake monasteries here. Gondar castle is quite a ruin, one can not go inside (at least in 2001) and I would not pay the high entrance fee once more. Forget about the "African Camelot" comparison used in LP guidebook. Lalibela has pretty high entrance fee as well (approx. 20 USD), but it it is spectacular and unique, even for people with little interest in Ethiopian Orthodox Church. And the surroundings of Lalibela consists of not much visited places, mountains, villages...which do not see so many tourists. The best way to explore the highlands of northern Ethiopia in limited time (e.g. 3 weeks) could be to start in Lalibela (and see some culture there as well...) and continue trekking to Simien mountains. Not many foreigners have done this trek...see above mountains section. Bad news in 2003 !!! Eth. Air. cancelled regular flights to Tum. Surma tribe became much more unaccessible. One can try a jeep road from the north there (about 200 km, almost no cars I guess) or nice about 6 days long trek along the jeep road from Jinka (shorter if you hitch some Park Office car). Or drive from Omorate to Kibish on Sudanese border and walk for several days to Surmas. This tribe is one of the least visited in Southern Omo, because it can't be easily reached by a car (fortunately, in comparison with very similar looking and much more visited Mursi). LP guide at least mentions this tribe, Bradt guide does not mention it at all. But they can be easily reached by flying to Tum (regular Ethiopian Air. flight in small 18-people airplane, from Addis Abeba, with several other stops, twice a week in 2001). I can't remember the cost , I think about 100 USD one way. Tum is just a grass airfield with a few houses. No car is there, but porters or guides could be hired there if needed. From Tum, one is in half a day in Maji, the biggest village on the way. Without guides or previous knowledge, it is better to follow the jeep road. It is longer than the path that locals use, but one can't get lost (I was following this jeep road as well). Maji is the main village in the area. There was no car there when I was there, just one motorcycle. But I managed to get some kerosene there for my gas stove (probably better to get it in Tum, where the airport is). No other road leads to Maji than a poor jeep road from the north, I think. (plus the one from Tum). From Maji, it is possible to go through the village of Mui (jeep road, about half day of faster walking) to the first Surma village - Kibish (one day of faster walking from Maji, in is not the Kibish marked on the maps north of Omorate, ot the border with Sudan...). Going first to Kibish (as I went) is not a good solution . First, I was required to pay 50 Birr (about 8 USD) for staying in Kibish (for services of policemen or for what ...). And second, the boss of Ethiopian militia in Kibish did not want me to leave Kibish to explore other Surma villages alone. He gave me 1 Ethiopian militia man + 1 local Surma militia man for another 50 Birr a day. The payment would not be the main problem, but these "guides" were quite lazy and did not want to go all the way I wanted. Next time, I would tell the militia in Mui that I go to Kibish, if they asked at all and I would avoid Kibish to explore many small Surma settlements around freely. By location and surrounding green hills, this is a plesant town. But not by peope. Local teenagers start to terribly anonying if you want to go by truck (and probably rented car as well) somewhere out. They will say, they there are 'official' brokers to supply truck drivers with passangers and start to be really aggressive when you want to deal with drivers themselves. Prices on often VERY and DANGEROUSLY overcrowded truck are serveral times higer for foreigners (I think even 10x). And to our surprise, neither these 'brokers' nor drivers were willing to negoitate a more realistic price - they rather take no foreigner (faranji), than to take them for reasonble price (that would be still higher than local, but not 5-10 times). We flew from Addis Abeba to Jinka to save time - good thing, but them wanted to travel by local transport as it's normally cheaper and better for contact with local people. But here, it was a mistake not to hire 4wd private car for maybe only 2-3 days. Instead, we were waiting e.g. 2 days in Omorate for a terrible truck full of empty bottles, that charged us prices higher tham rented 4wd car (for 4 people) as the driver knew, we had no other choice. And again, if you don't want to pay such price (e.g. 200 birr per person Omorate to Arba Minch), you don't go, no business atitude - I would call this even hostile atitude. So if you fly to Jinka already to save time, rent a 4wd there, otherwise both cost and time saving will be lost while waiting for overpriced trucks. Once out of Jinka, Bana and Tsemai people aroudn Key Afer are quite pleasant.They even don't insist on payments for photos. Hamer, although quite pleasant as well, do insist on payment for photos. Omorate - quite anoying people. Truck sits on the west bank of Omo and that goes sometimes with goods to Kibish on Kenya border and Bume village on west bank (opposite to Murle on the east). We were supposed to go there, but the driver changed mind and went elsewhere. Omo river is nice to see here, as is Dasanech village on the other bank - but it's a terrible photo business, with people too eager to be photographed for money. Generally, I was not impressed with people here. We set for an overnight trip to explore the bare hills around Mt. Guge (about 3600 m I think). It easy to follow a good dirty road to a village Mesho (coordinates : 6.261560, 37.526790), Mt. Guge can be then seen about 2 hours away. This was a nice short thip, spoilt a bit by the fact, that we were from morning till evening followed by a teenager who wanted some money (later more childern came, so it ended with throwing stones etc.). Hopefully, other foreigners will be able to avoid this. Nechisar park - worth of approx. half day trip by rented 4WD, price about 800 birr. If people plan to rent 4wd anyway, better to have it already, as such price is generally quoted for full day rent for several days. My friend walked all the way to the hot springs (and went back by car), we found this too long and exhausing - but good for people with a lot of time. Gazeles, crocs, zebras, pigs, hippos, monkeys and birds can be seen (from car as well). 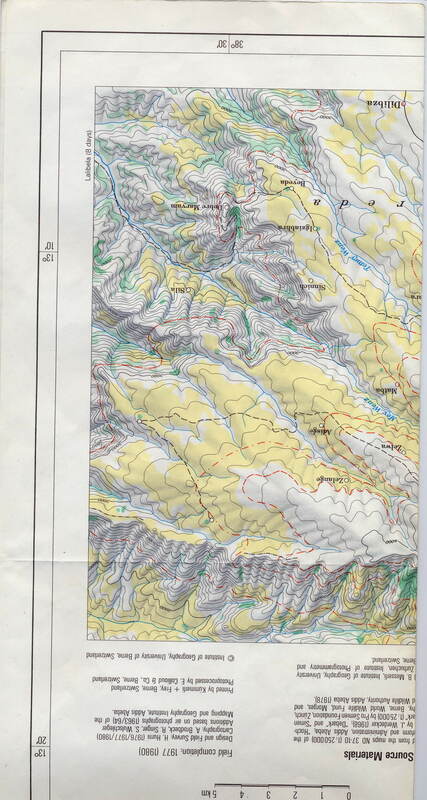 The only map usable for trekking available outside Ethiopia is a Swiss published 1:100 000 Simien mountains map (very good) and one for Bale mountains. 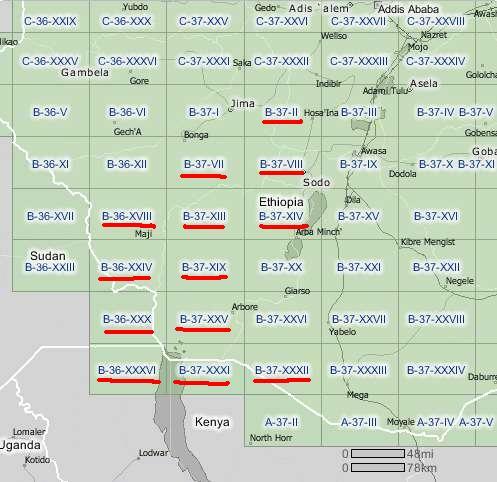 The only solution for all other areas seems to be 1:250 000 maps from Ethiopian Mapping Authority (EMA) or 1:200 000 Russian Military maps series (see some down here). These Simien maps are usefull e.g. for approach of Simien mountais from the east - from Lalibela/Sekota or better Mekele. The trip that I was thinking to do in 2000, then 2004 but never did. Let them be usefull to someone else that does it despite the limited usefullness of Russian military maps in Ethiopia in general. 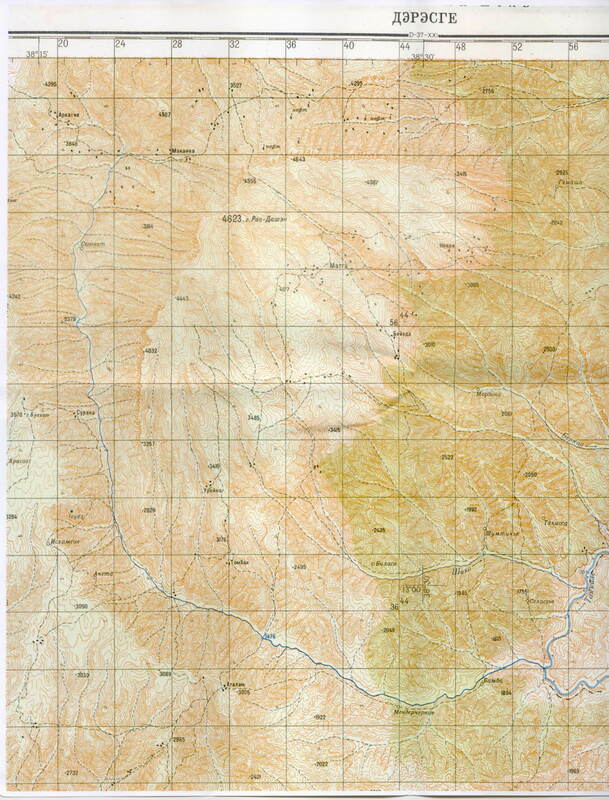 One needs a written letter from Ethiopian Tourist Commission (located on Mesqel square, quite near to EMA fortunately, see LP or Bradt guide) to buy 1:250 000 EMA maps of requested areas. 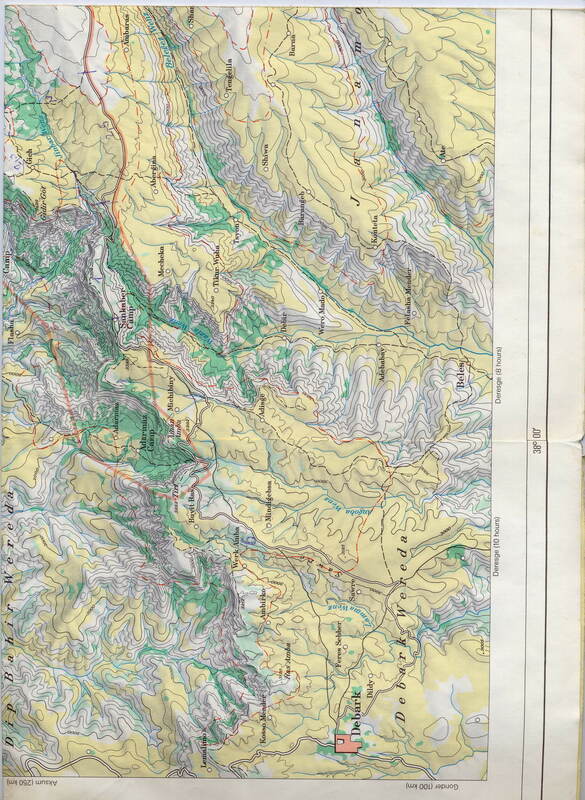 One can generally get maps of all Ethiopia with the exception of border regions. This exception can be a problem sometimes - e.g. 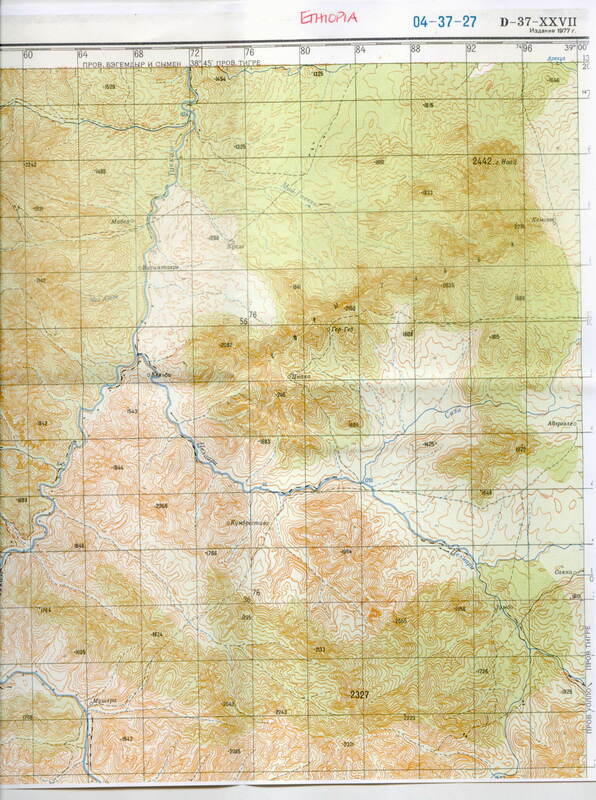 many sheets covering Omo valley area cover parts of Sudan, so cannot be purchased. 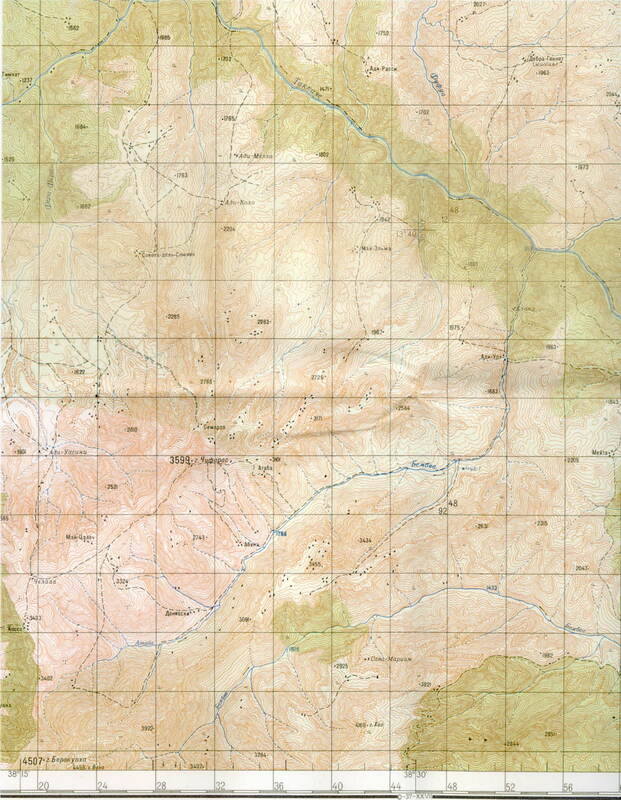 1:200 000 Russian military series maps are old as well, roads are drawn approximately only, names of villages are often not very usable now. 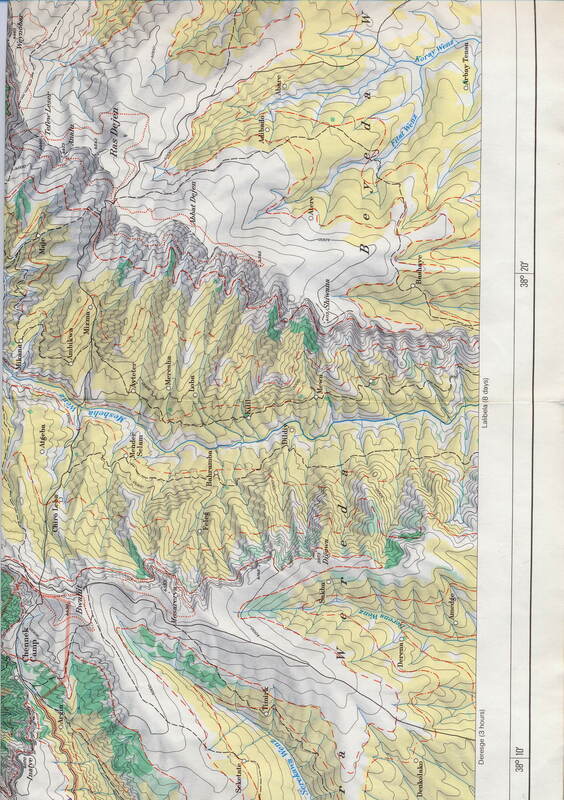 But they are topographically quite good and they can be acquired for all Ethiopia including border areas. 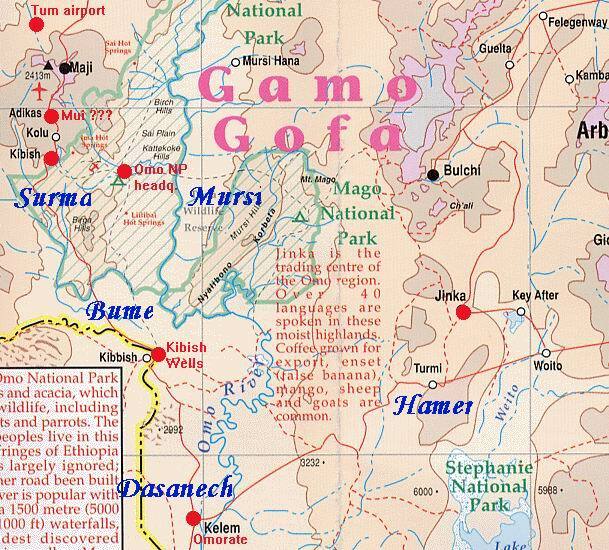 See University of California page for Omo region or commercial map shops for other areas. 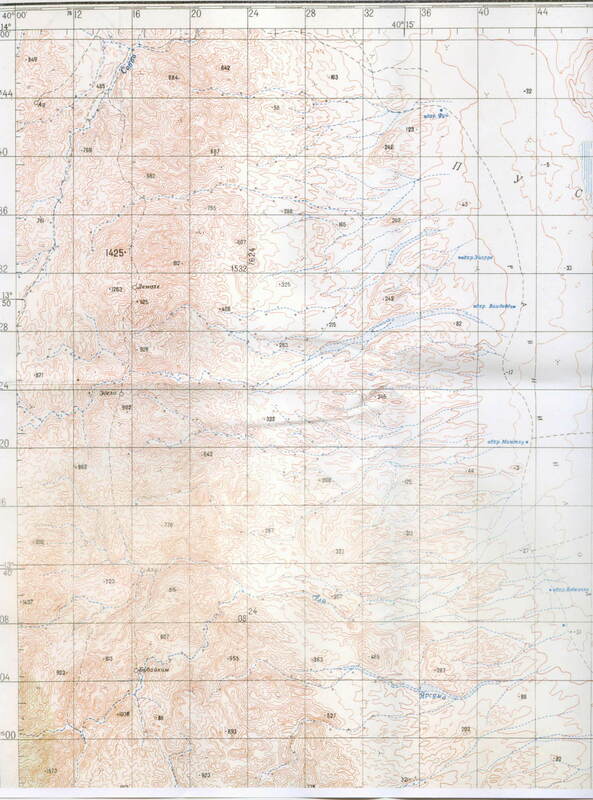 Maps of Omo region take are available online - see sheets coverage with marked sheets available for download in 1 zip archive here. 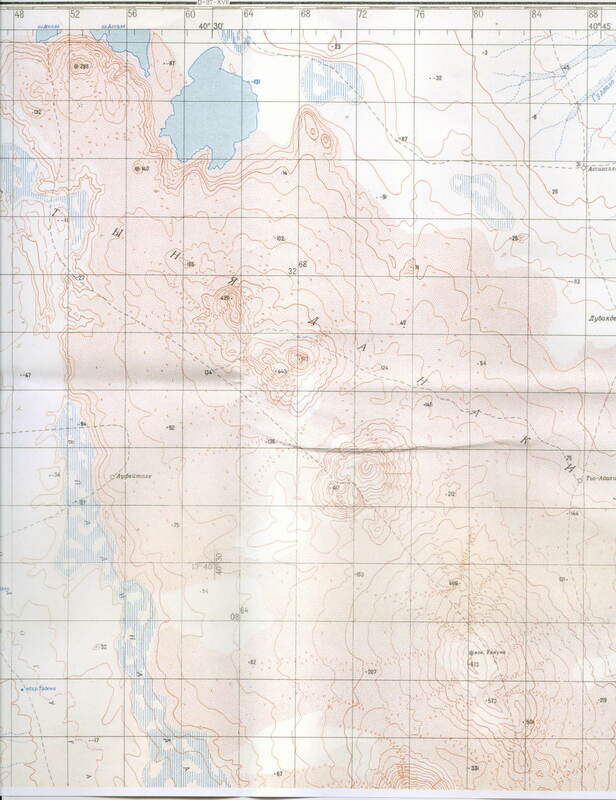 Bradt guide writes about 1:50 000 maps in EMA but questions the availability to buy them even with the permission. 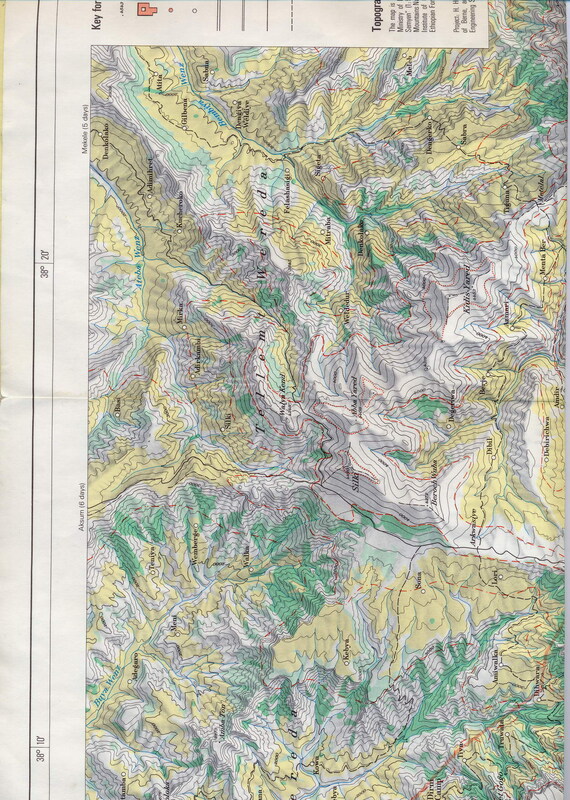 I doubt such maps can be bought, at least they were not shown to me when I asked what were the best maps possible to buy. It is possible to buy 1:1 000 000 sheet of all Ethiopia in EMA without permission if I remember. EMA is open on weekdays only, till about 5 p.m. if I remember. The address for EMA is : P.O.Box 597, Addis Ababa, tel:01 518445, fax: 01 515189 according to Bradt guide. It it marked in the guidebook map, physical location is near to Hilton hotel. It is just up the to top from the Tourist Commission, on the left side. As far as guidebooks is concerned, one has a choice between Lonely Planet Ethiopia/Eritrea/Djibouti published in November 2003 (2nd edition) and Bradt Ethiopia published in 2002 (3rd edition). LP has better pocket format and more practical info about e.g. buses departures etc. but Bradt might give you more historical background. A great article about the territorial and ethnic problems of the border area called Ilemni triangle (Ethiopia-Kenya-Sudan) here. This web page was created with ezHTMLarea.